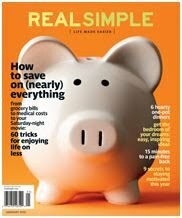 Go here to possibly get a free subscription to RealSimple. The first 500 "qualified people" to sign up will receive a subscription. Unfortunately, it does not state what makes you qualified or when they have reached 500 people. It's worth a shot though. I have received free magazines from them before with no problems.